There are many reasons to exercise. Protecting your brain health and optimizing your thinking ability is one of them. In fact, there’s compelling evidence that exercise produces large cognitive gains, improves memory, and helps fight dementia. For example, a 2010 study1 on primates revealed that regular exercise helped the monkeys learn new tasks twice as quickly as non-exercising monkeys, and researchers believe this might hold true for people as well. Strength training in particular has been shown to have a very beneficial impact on brain function and memory. In one study2 — featured in the video above — just 20 minutes of strength training was found to enhance long-term memory by about 10 percent. In this experiment, 46 volunteers were randomly assigned to one of two groups — one active, and one passive. Initially, all of the participants viewed a series of 90 images. Afterward, they were asked to recall as many images as they could. Next, the active group was told to do 50 leg extensions at personal maximum effort using a resistance exercise machine. The passive participants were asked to let the machine move their leg, without exerting any personal effort. Two days later the participants returned to the lab, where they were shown a series of 180 pictures — the 90 original photos, plus 90 new ones. Interestingly, even though it was two days since they performed the leg extensions, those in the active group had markedly improved image recall. The passive control group recalled about 50 percent of the original photos, whereas the active group remembered about 60 percent of the previously shown images. “Our study indicates that people don’t have to dedicate large amounts of time to give their brain a boost,’ says Lisa Weinberg… who led the project. Another recent study supports these findings, and suggests that working your leg muscles helps maintain cognitive function as you get older. According to the authors, simply walking more could help maintain brain function well into old age. “The researchers found that leg strength was a better predictor of brain health than any other lifestyle factor looked at in the study. Previous research has demonstrated that exercise promotes brain health by releasing hormones from the muscles, which encourage the growth of new brain cells — a process known as neurogenesis or neuroplasticity. Your brain’s hippocampus, i.e. your memory center, is particularly adaptable and capable of growing new cells throughout your entire lifetime, even into your 90s, provided your lifestyle supports it. For example, one year-long study found that adults who exercised regularly were actually enlarging their brain’s memory center by one to two percent per year, where typically that center shrinks with age. The study on twins is said to be the first showing a specific link between leg power and cognition in normal, healthy people, and this is great news, as your leg muscles are among the largest in your body and can be easily worked, either through seated leg exercises, or by standing and walking. The hippocampus belongs to the ancient part of your brain known as the limbic system, and plays an important role in the consolidation of information from your short-term memory to your long-term memory, as well as spatial navigation. Previous animal research9 has found that not only does exercise activate hippocampal neurons, it actually promotes their growth. In one study,10 exercising mice grew an average of 6,000 new brain cells in every cubic millimeter of tissue sampled. The type of exercise program that will benefit your brain is identical to the one that will benefit the rest of your body. Ideally, you’d want to strive for a comprehensive routine that includes high-intensity interval exercise (HIIT), strength training, core work, and stretching. Then, in addition to a well-rounded workout routine, I also recommend standing up as much as possible to avoid the well-documented hazards associated with chronic sitting, and walking 7,000 to 10,000 steps a day. Daily walking has been found to trigger an anti-aging process, and recent research suggests it may add anywhere from three to seven years to your lifespan. It’s clearly an essential movement we all require, ideally in addition to a regular exercise program. And, once you’ve eased into a daily walk routine, you can easily turn it into a high-intensity walking workout, which may be especially beneficial if you’re elderly or unable to engage in other forms of high-intensity exercises. Part of what makes walking so beneficial is that when you’re walking you can’t be sitting. Sitting for more than eight hours a day is associated with a 90 percent increased risk of type 2 diabetes, along with increased risks of heart disease, cancer, and all-cause mortality.13 I personally walk about two hours a day; about 60 miles per week. I do this barefoot without a shirt on at the beach — this way I’m able to get my sun exposure at the same time, which is an added benefit. I also like to read while I walk and this allows me to read two or three books a week. Multi-tasking like this allows me to easily justify the time investment and reap the many benefits that daily walking offers. I have been doing this now for more than a year and have logged 3,000 miles, which is the distance of walking across the US. In addition to these daily walks, I also do some form of regimented exercise each day. This includes strength training four times a week. My current goal is to deadlift 400 pounds. Got up to 340 but have a ways to go. I also do a daily 30 minute stretching routine on the Power Plate. HIIT, which is a core component of my Peak Fitness program, maximizes your human growth hormone (HGH) secretion, optimizes your metabolism, and helps regulate your insulin and blood sugar. And nothing beats it in terms of efficiency. You can complete an entire Peak Fitness workout in 20 minutes or less. My previous article, “Peak Fitness: Reap the Benefits of High-Intensity Interval Training,” details the benefits of HIIT and offers guidance, instructions, and demonstrations for how to perform HIIT with or without equipment. Getting back to strength training and working your muscles is important not just for its brain-boosting effects. It produces a number of molecular, enzymatic, hormonal, and chemical changes that help slow down and even reverse a number of diseases, including type 2 diabetes, osteoporosis, and heart disease. And, contrary to popular belief, strength training is particularly important for the elderly. By strengthening muscles, connective tissues, tendons, and ligaments, strength training helps you maintain a stable body position, and allows you to perform everyday activities like climbing stairs and getting out of a chair with greater ease. This freedom of movement adds to your quality of life, but the benefits don’t end there. One study showed that strength training in the elderly genetically turned back the biological clock about 10 years! If you’re elderly and have been sedentary for some time, I suggest you begin by taking a look at my “Basic Exercise Guide for Older Seniors and the Infirm“. It contains basic seated and standing exercises that can help improve balance and coordination. My article “Easy Strength Training Moves for Seniors” contain beginner’s level strength training exercises, which you can then move into. 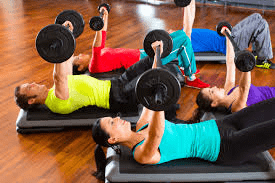 For the rest of you, I suggest reviewing my “Beginners Guide to Strength Training,” which lists a number of strength training options, such as body weight exercises, kettle bells, resistance bands, medicine balls, resistance machines, and more. Last but not least, you can also turn your strength training routine into a high-intensity exercise. This is done by slowing down your movements. Super-slow weight training is a particularly well-suited form of high-intensity exercise for older individuals, as it actively prevents you from accidentally harming your joints or suffering repetitive use injury. In the video below I discuss and demonstrate the proper execution of a number of different super-slow weight training exercises. They can all be done using either free weights or machines. The benefit of using a quality machine is that it will allow you to focus your mind on the effort, as opposed to the movement. The typical super-slow resistance workout can be completed in about 15 minutes. Just one or two of these workouts are needed each week, as you need to make sure you’ve sufficiently recovered between sessions. This entry was posted in Alternative Medicine, E Patient Health Care, Home Remedies Series, Introducing, Lifestyle Health, Longevity, Medical Studies, Tele-Medicine, Weight Management and tagged brain's memory center, Daily walking, dementia, E-Patient Health Care, high-intensity walking, leg strength, Stay in Constant Motion, strength training, Strengthening Your Body, Strengthens Your Mind by Admin. Bookmark the permalink.